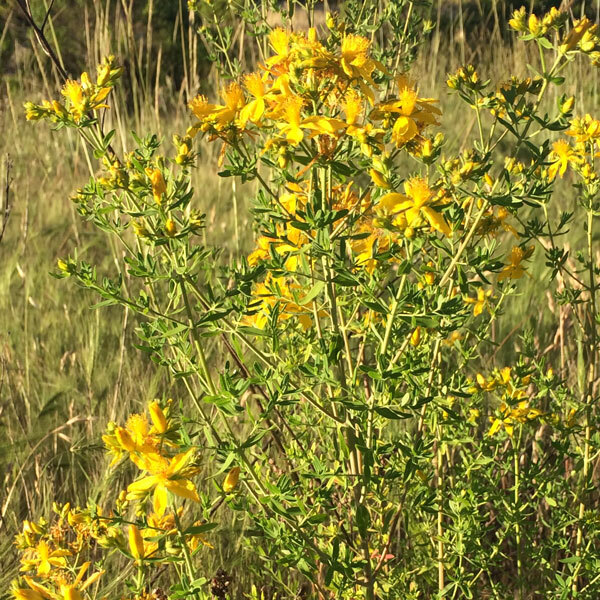 Blooming around the summer solstice is the cheery yellow flower of Saint John’s Wort, Hypericum perforatum, a native herb to Europe but naturalized throughout North America where soils are poor. It grows so prolifically in some areas as to be considered a “noxious weed”, since livestock who graze on it can become photo-sensitive, but herbalist know that this golden flower is true gold! St. John’s Wort can cause some folks contact dermatitis if large quantities are handled without gloves. Occasionally, it causes sensitivity to light for those taking larger, oral doses. This effect resolves itself when dosage is reduced. St. John’s Wort is an herb of protection from bothersome energies and was traditionally hung above the house door, or strewn in the corner of rooms for this purpose. The healing oil of the plant can be viewed when holding the leaves up to light to see the little red dots that indicate pores of the red oil. Healing oils and pigments are also contained in the little yellow flowers with orange streaks, so the entire tops are harvested anytime during bloom for medicine. These tops can then be dried for tea, soaked in vodka, grape alcohol for tincture, or soaked fresh in olive oil for salves. My favorite use of this plant is via the oil, so I chop up the leaves, flowers and stem and place it in a brown glass jar, then cover it with cold-pressed olive oil and/or jojoba and let it sit in a warm place for three or four months. The decanted oil or tincture is a lovely darkish red color. Rub the oil directly onto the body to heal sore muscles, joints, burns, damaged or painful nerves, gout, sprains, sciatica and can be ingested for repairing intestinal tract tissue as well. The tincture or tea of St. John’s Wort strengthens the 3rd chakra or energy center at the solar plexus, and of which the liver, gallbladder and pancreas are a part. It is an effective liver decongestant and detoxifier – so effective that it is contra-indicated with some pharmaceutical medications because it removes them from the system rather quickly. This effect on the liver helps with over-all digestive assimilation and the elimination of toxins from the body, which may be part of its anti-depressive action. St. John’s Wort a mild serotonin uptake inhibitor, which means it extend the effects of natural serotonin in the brain. Serotonin is an important neurotransmitter that links the ‘second brain’ we have in our gut (specifically the many neurotransmitters that inhabit the small intestine) with the vast cerebral space of our head. Therefore it is a useful herbal aid for emotional depression, seasonal affective disorder (SAD), anxiety, nervous exhaustion and mental weakness. I have found it is very helpful for those suffering the depression of grief, loss and difficult life transitions (puberty, peri-menopause, retirement), by using it regularly for two to three months, then tapering off. The plant power of St. John’s Wort is also prevalent in its homeopathic form for nerve trauma – especially where there is inflammation irritating the nerves with sharp, shooting pains. This includes injuries to the coccyx, dental nerve pain, and pain during and after surgery. The tincture works for nerve trauma and repair as well, and is useful for urinary tract problems like bedwetting, kidney stones (to help deal with the pain) and irritation of the bladder. I love to make flower essences and the essence of St. John’s Wort is an excellent one for nightmares, the feeling of being possessed by another, feelings of disconnection, and feeling low-spirited. I feel this plant hones in on any ‘dark corners’ of our body and helps to illuminate them so that we can move on. St. John’s Wort, should be a part of everybody’s medicine chest.